Generally, two fusing glass layers are all that are used to make a fused art glass jewelry piece about a quarter of an inch thick (6mm). The natural tendency of glass is to spread or contract to reach a quarter inch size during the fusing process. If required there are a number of ways to produce thick glass items in a glass fusing kiln. Thick slabs can be produced through using a pot melt, pattern bar or by dams set up on a kiln shelf to hold the glass and prevent it spreading. Dams of one type or another can be used for the above techniques. It is possible to make thicker fused glass pieces without using the above methods. By firing individual pieces and then fusing them as a stack, a thicker piece can be created. Using this method glass powder or frit can be fired and smoothed out before including in the stack. This approach will minimize air bubbles occurring. A couple of pieces are tack fused together before the stack is finally fired in the glass kiln. It is not always possible to fire small inclusions between the sheets as bubbles may be of concern. The flatter the glass the better. A shape can be cut out from the glass piece and a mirror image of a different color inserted, does require cutting skills. The following explanation and photo shows how a jewelry piece can be constructed using multiple firing and tack fusing. Four pieces of clear glass have been used to make the final piece. It is made from pieces 1/2" wide x 11/2" long. Two pieces are covered with glass powder and then lightly tack fused in a glass kiln to fuse and smooth the powder. Clear glass strips are then fused to the powdered strips. The fused pieces are then stacked and fired again in the glass fusing kiln at just above tack fusing temperature to provide some rounding of the glass. This technique will make a pendant about 3/8" thick. 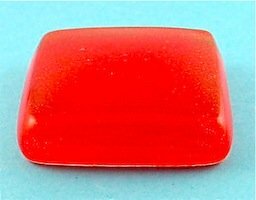 If using glass of the same color, tack fuse two pair together and then both pair are stacked and fused in the glass kiln. Single pieces of glass can also fired at a low tack fuse temperature to smooth the glass. from four layers of glass about 1 1/2" square by 3/8" thick. The same process was used in fusing this piece. It is possible to build quite large and thick art glass pieces this way. It is very important to note that large pieces will need to have a bubble squeeze and annealing stage built into the fusing schedule. Some large pieces may need cold working to achieve a smooth and polished edge finish. A discussion of glass thickness can be found on this site at glass volume control.